It’s now easier than ever to write conditional logic in Microsoft Flow by using the new advanced condition builder. 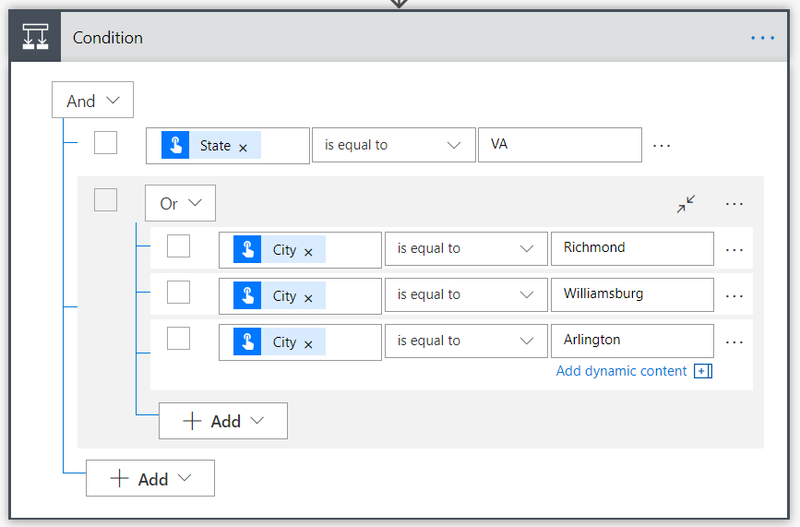 Previously, you could write complex conditions using expressions, but now it’s possible to build conditions with the Microsoft Flow designer’s simple point-and-click UI. Add row – Each individual condition you check for (such as the value is greater than 10, or the list does not contain Test) creates a new row in the condition builder. Add group – You can combine one or more rows together in a group — each group is combined by either an And or an Or. If you select And then all the rows must be true. On the other hand, if you select Or, then only one of the rows needs to be true. You can have however many rows or groups you need to build out your logic, and can continue adding rows (or groups) both at the top level of the condition, and inside groups using their Add buttons. If you want a simplified view of the condition there is a button at the top-right of each group to collapse it. Additionally, there is a ... menu at the right side of each row and group. This contains options for moving rows up or down (which can move them in and out of groups), and an option to Delete a row or group. Also, there are checkboxes on the left side of each row or group. This allows you to select several different rows, and then select Group from the ... menu at the right to combine the rows into a single group. Sometimes, there may be an expression that is more complex than what you want to model in even the advanced condition builder. Previously, you could select Edit in advanced mode and then enter the expressions in a text box. However, this old mode was difficult to work with as it did not give you access to IntelliSense for expressions or Dynamic content. There is no longer an Edit in advanced mode – instead if you want a very complex expression you can use the regular Dynamic Content expression builder to enter your expression on the left side of the row. Then, select Equals to and enter true in the right side. The advanced condition builder is available for all new conditions that you add to your flows. It will not be enabled for existing conditions, so if you would like to use it with existing flows you will need to add a new step and drag the actions from the old condition to the new condition. Personal productivity is essential to teamwork. SharePoint lists and libraries have long allowed to you defined custom metadata columns to track dates. We now are releasing a new capability that lets you set reminders for any of these dates. You’ll be able to receive a personal email alert x days in advance of a date on any document or item in SharePoint. To create the reminder flow, your list or library should have at least one date/time column in the current view. 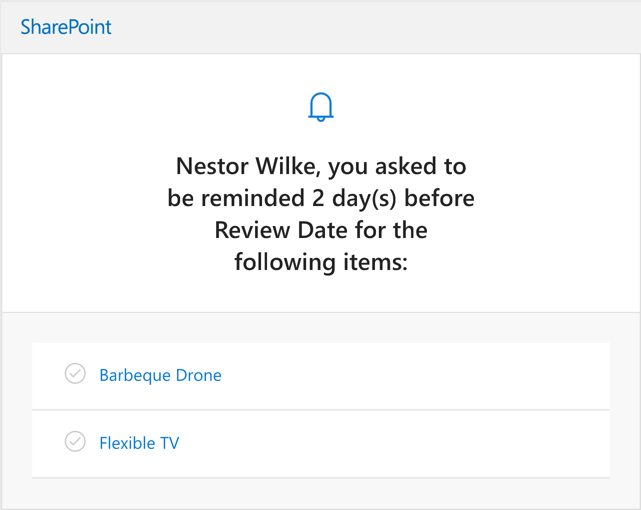 You’ll then able to create a reminder by selecting the Flow -> Set a reminder menu item. You can enter the number of days in advance for the reminder, based on the selected date column. 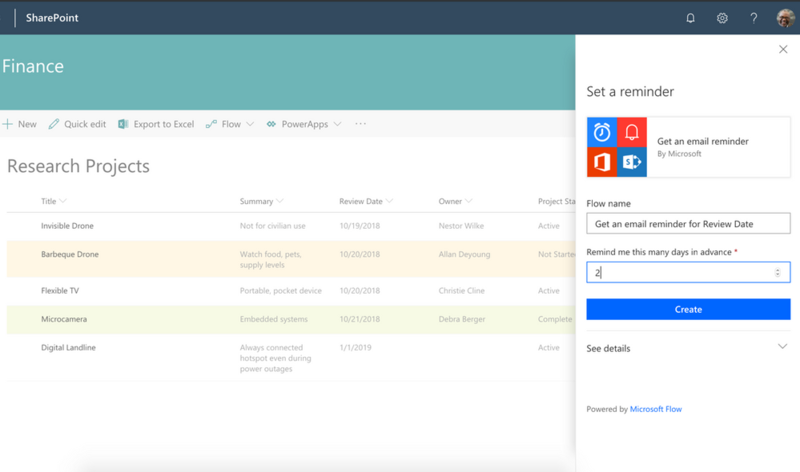 Based on your selection, you’ll get an email from Microsoft Flow for any items or documents x days in advance of the selected data column value. 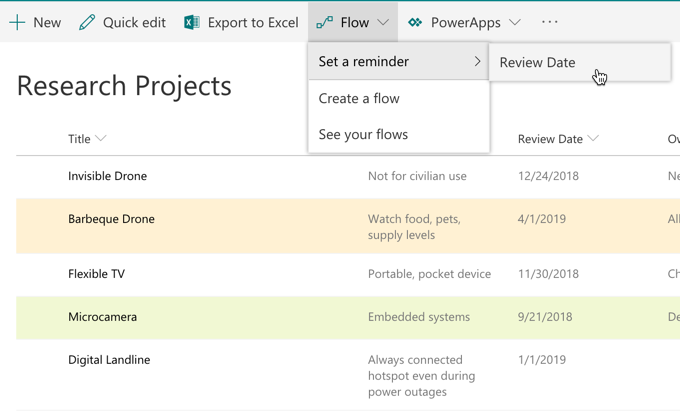 Once the flow is created, it can be edited from the Microsoft Flow portal. You can modify days in advance, or add additional actions. Read more about this feature in the SharePoint documentation. If you have a large action with a many different inputs, sometimes it can be difficult to understand exactly what will be sent to the Connector from your flow. 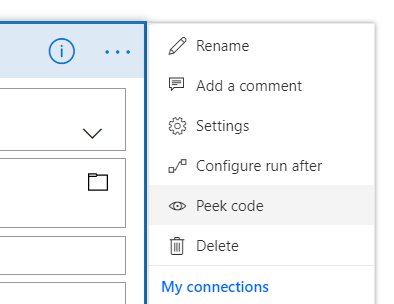 We have added a new Peek code option in the ... menu of all triggers and actions in the Flow designer. When you select this option you will see the full JSON representation of that action. This includes all of the inputs to the action, such as the text you entered directly, and expressions used. For example, you can select expressions here and paste them into the Dynamic Content expression editor. This can also give you a way to verify that exactly the data you expect is present in the flow. Simply select Done at the bottom of the action to return to the normal action view. 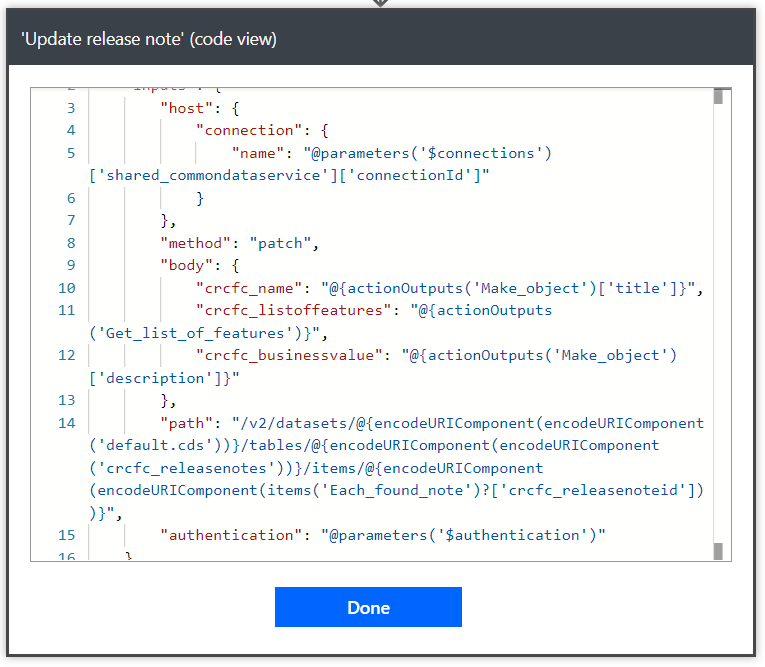 Microsoft Graph Security – The Microsoft Graph Security connector helps to connect different Microsoft and partner security products and services, using a unified schema, to streamline security operations, and improve threat protection, detection, and response capabilities. Learn more about integrating with the Microsoft Graph Security API at https://aka.ms/graphsecuritydocs. XooaDB – Xooa is a platform as a service (PaaS) dedicated to making private blockchain easy. With the Xooa connector, you gain an immutable ledger and blockchain infrastructure in minutes. You control who can view and participate in the ledger, and you can shift your data to your own network at any time. The Xooa connector enables users to link Microsoft Dynamics with a private blockchain ledger. Those users can control permissioned access to information stored in the ledger. The connector provides a simple and immediate facility for cross-organizational data sharing.